This easy to prepare breakfast casserole is made up the night before, so all you have to do in the morning is pop it in the oven and enjoy! 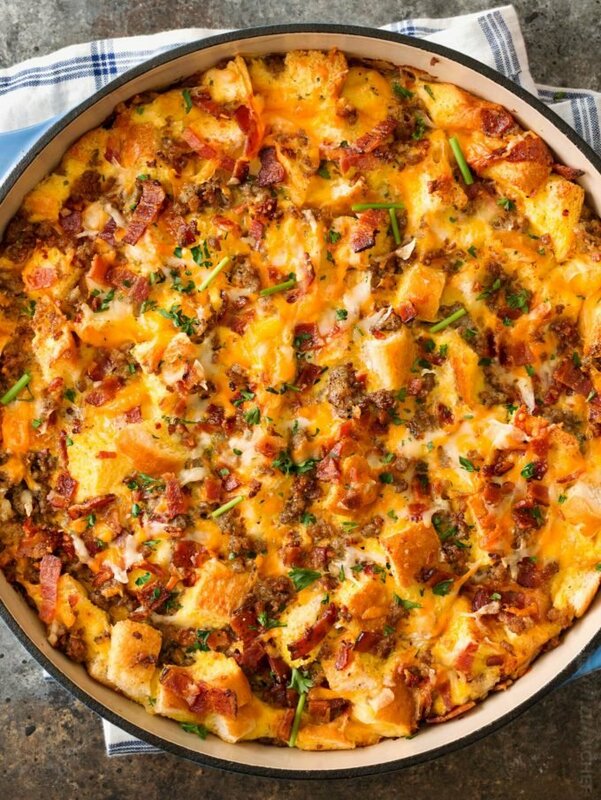 Take it easy on yourself by making this breakfast casserole the night before, then bake it in the morning while you get ready! 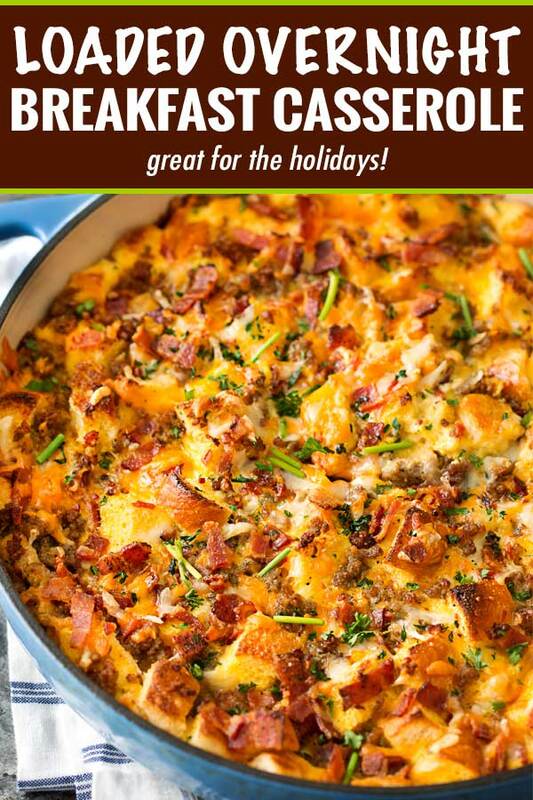 A true crowd pleaser, this breakfast bake is perfect for holiday breakfasts or when you have guests! For some people, Christmas dinner is the main event on Christmas, but in our family, it’s breakfast Christmas morning! Since we’ve had kids, my parents and brother make the trek over to our house early in the morning. We all sit down around our table (as many as can fit anyway), mugs of steaming coffee in our hands, and eat a hearty, stick to your ribs, breakfast that will last us through the many hours of gift opening to come. We have a tradition in our family that on Christmas, everyone gets a gift, but we only open them one at a time, which is nice, because then you’re guaranteed to be able to watch your loved one open that gift you’re so excited to give them! It also means that it takes us a lot longer to get through all the presents lol. So we definitely need that hearty breakfast to fuel us up! 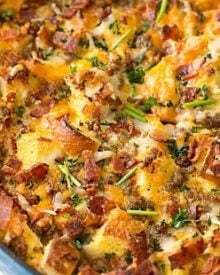 Several years ago, on the first Christmas morning at our house, I served this overnight breakfast casserole… it was a TOTAL hit! There are rarely any leftovers, and usually we’re all scrambling to grab the last piece. We usually just call it “the breakfast casserole”, but technically, it’s a strata since the base of the dish is cubed pieces of bread and they soak overnight in a spiced up egg custard. CAN BREAKFAST CASSEROLE BE MADE AHEAD? Yes, in fact, it’s best when it IS made ahead of time! 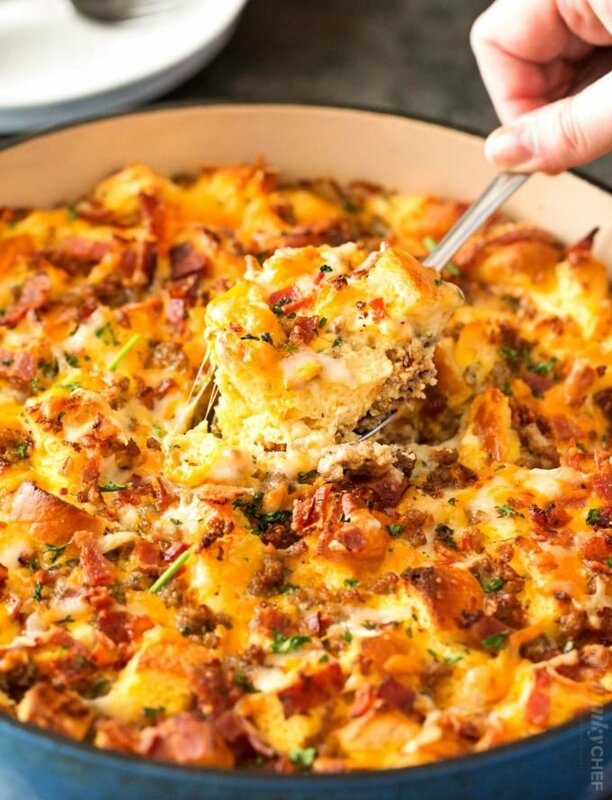 You can make this breakfast casserole up to 8-12 hours ahead of time. My favorite way is to make it on Christmas Eve after dinner, then let it chill overnight and bake it Christmas morning! You want it to sit in the refrigerator so the custard really soaks up into the bread and all the flavors come together. WHAT CAN YOU PUT IN A BREAKFAST CASSEROLE? Just about anything! I’ve seen breakfast casseroles made with tater tots, hashbrowns, croissants, etc. 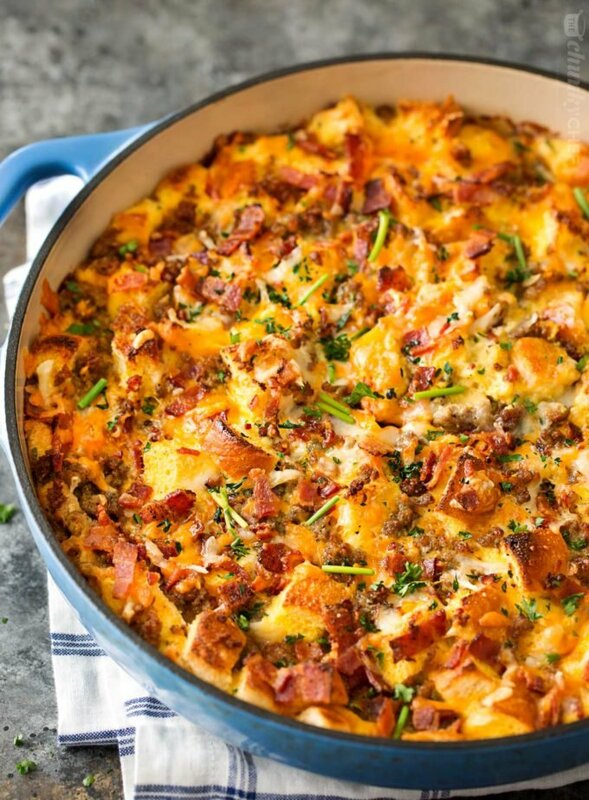 I love my breakfast casserole loaded with sausage, bacon, and plenty of cheese! I love using both the sausage and the bacon here, as we’re huge breakfast meats fans around here, but feel free to use one or the other if you’d rather not use both. 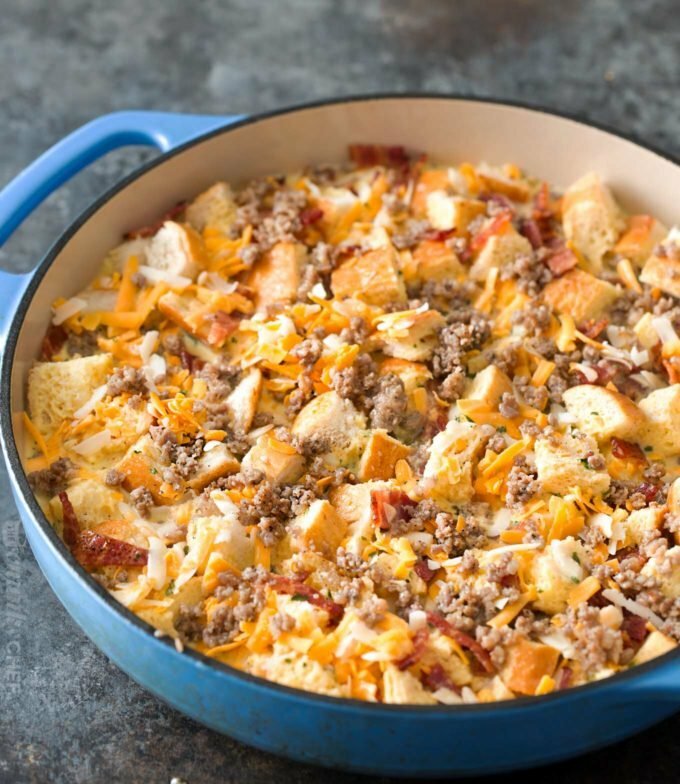 CAN YOU FREEZE BREAKFAST CASSEROLE? Yep! After you assemble the casserole, instead of covering it and refrigerating, place it in the freezer instead. Breakfast casseroles can be frozen for up to 2 months, then just thaw overnight and bake as directed. 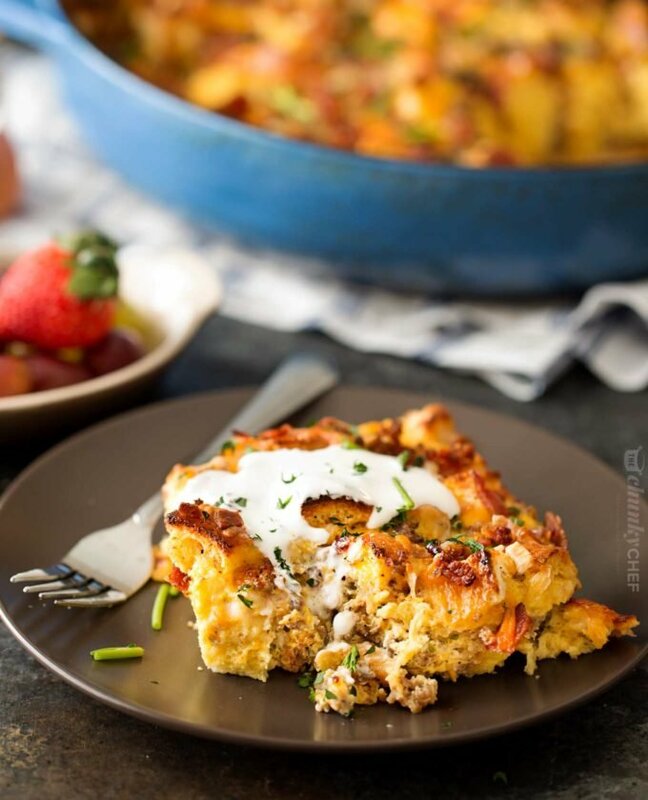 I hope you guys give this overnight breakfast casserole a try… it’s perfect for not only holiday breakfasts, but for weekend breakfasts as well! 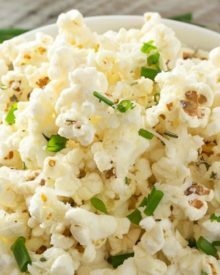 We like to serve ours with a dollop of sour cream and sprinkling of fresh parsley and chives! Enameled Cast Iron Casserole Dish – I love the even baking in this dish, plus the easy cleanup! In a large skillet, brown and crumble sausage until cooked. Drain and set aside. Use a bread knife to cube Italian bread into 1/2" pieces, then set aside. 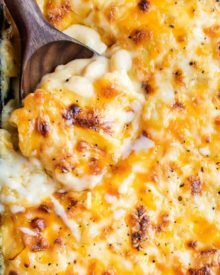 Combine shredded cheddar and Gruyere cheeses, then set aside. To a large mixing bowl, add eggs, milk, salt, dry mustard, dried parsley, black pepper and paprika. Whisk until combined. Add cubed bread pieces to bottom of 3 quart oven safe pot, or 9x13" baking pan. Top with crumbled sausage, bacon, and 3/4 of the cheeses. Pour egg custard over the top, using a wooden spoon to gently push any un-soaked bread down into the custard. Sprinkle with remaining shredded cheeses. Cover pan with foil and refrigerate overnight. 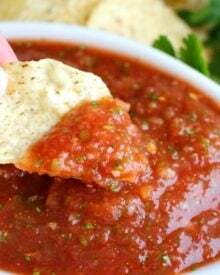 Remove from refrigerator, uncover, and let sit at room temperature while oven preheats to 350 degrees F. Bake, uncovered, for 40-45 minutes, until a toothpick inserted into the center comes out clean. Serve hot, topped with garnishes if desired. Would you be able to replace the bread with potatoes? Or would that change the consistency? I haven’t tested the recipe using potatoes, so I can’t say for certain that it would work, and/or wouldn’t change the taste/consistency. How much in oz or how many cips of bread would this be? 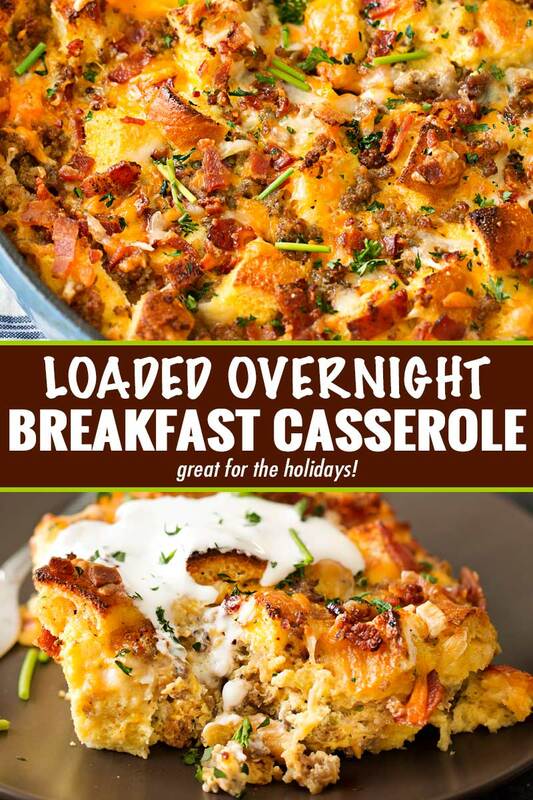 My step-mom and I have been making overnight breakfast casseroles for years for Christmas morning and this one is fabulous! We loved it! 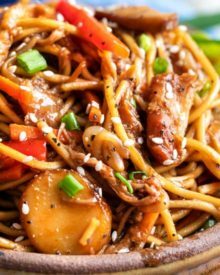 It’s delicious and excellent as leftovers! I was going to make it for Christmas morning but you know what they say about the best plans..so I made it today instead. It was delicious & my boyfriend loved it! I ran out of sour cream so we topped it with warm maple syrup. Swoon. I made this last night and put it in the fridge but the party was cancelled. Can this dish be put in the freezer? If so, would I bake it first? I made a similar recipe one year for Christmas breakfast. I used both French bread and a loaf of Jalapeño Cheddar bread I bought in the bakery section, and added mushrooms to half the pan (my husband isn’t a fan), it was fabulous! I’m making this recipe this year with the Jalapeño bread, and probably adding leftover ham as well. It’s a very easy recipe to play with! WOW!! This looks SOOOO good! This looks so good! I would love to have this Christmas morning! This looks absolutely amazing! I love overnight breakfasts, and I’ll definitely be giving this one a try! This is exactly how I want to start my mornings especially during the holidays. So hearty and delicious! Great recipe! There were only 6 of us, but it would easily have fed 12. We made the overnight breakfast strata. Yummy! But we added mini tater tots to the top before baking the dish. Added some Minnesota yumminess. Could I mix all the ingredients how you’ve explained and put in the refrigerator around 2:00 pm and bake it the next morning around 8:00 am? I was afraid that might be too long for it to sit in refrigerator. I am going to make this Breakfast Strata to take for Election Day Breakfast for my fellow Election Board Officials on November 6. I am also making a separate Breakfast Casserole for those who may be gluten free or gluten intolerant. Thanks for the RECIPE. 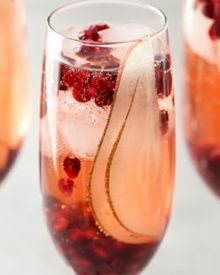 This looks delicious – I’m thinking about making it for a Brunch themed work event this week! What are your thoughts on baking it a day earlier and then warming it up the morning of the event? My office doesn’t have an oven so I’m trying to think of ways around this hurdle. Do you think it will affect the dish in any major way? Hi Marissa 🙂 I wish I could give you a definite answer, but I’ve never tested the recipe that way, so I can’t say for certain. I think if you have the ability to have those sterno cans with the foil chafing dishes at your work, you might be able to heat it back up that way, but it would definitely take a while. Could you bake it in the morning before work and get one of those carriers for 9×13 pans that have the ability to keep the food hot? You could do that then keep it warm on the sterno chafing dish thing? I would love to try this with bagels. How many do you think I should use and do you think I need to cut them into smaller pieces bc of the chewiness? Also was wondering what you thought of using Everything bagels? I used Chorizo and added Gouda cheese. Turned out amazing! Made this for a crowd at a Wimbledon champagne brunch, and it was fantastic. I swapped out the parsley for rosemary which gave it a slightly different flavor profile, rosemary is so nice in dishes with sausage. 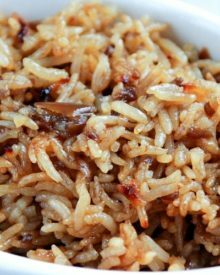 Everyone loved it, it is hearty, generous in size, and a little decadent. Thank you! Fantastic recipe! A hit with my family and has now been added to our favourite recipe list. Such peace of mind that my main course was prepped the night before too! Highly recommended. What changes should I make if I want it to serve 12. Eggs? Milk? Cheeses? Hi Jeri 🙂 I would probably 1.5x all the ingredients, and use a whole loaf of bread. Just make sure you’re using a really big pan, I’d say at least 4 quarts, or a large lasagna pan. This may take longer to bake as well. I’ve never made it other than the recipe specifies, so I can’t say for certain the exact changes. Does this work for leftovers? You mean using leftover sausage and bacon? Yes, absolutely! We had this on Christmas morning. Delicious and filling! Trying so many for years. Yours with variations is the cats meeeeeeeeeeeow. Thank you thank you. I am on a low carb diet & would like to leave out the bread. How will that affect the cooking time? Hi Claire 🙂 I’ve never left the bread out, as the bread is what makes it a strata. Sorry I can’t be of more help! Can you tell me approximately how many cups you consider “3/4 of a loaf of Italian bread”? 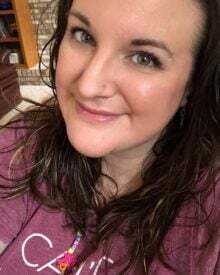 Hi Cathy 🙂 I would say anywhere from 8-10 cups, depending on how it’s cubed and the type of bread. A typical loaf of bread is 16 oz, so you’ll want to use about 12 oz. Can you make this two nights ahead? Likewise it Friday night and serve Sunday? Or is that too long to just sit in the fridge? Hi Kate 🙂 I’ve never done it two nights ahead, but I think it should be okay. The bread may be softer since the soaking time is longer, but it should still taste great! Made this last week end ! I used diced ham and a pkg real bacon bits added a couple cups browned hash browns with ham and bacon. Used 1C. Croutons in place of bread . 1 tsp. Cumin. 1/2 red pepper, celery 1/2 C. And about 6 sliced Bella mushrooms! O my what a awesome dish! I took a piece for breakfast to work each day. Everyone one was asking for recipes. Just by the looks at it they thought it looked great! Thanks. Amanda, your recipes were an absolute hit at my ladies breakfast! 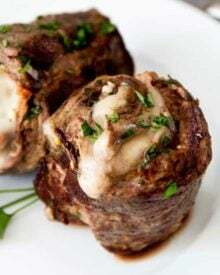 I had made this mouth-watering strata and your Ham & Cheese Spinach Puffs and my friends just loved and savored every bite. I substituted chicken cubes instead of the ham and that’s all I changed in the recipe. Thank you for these wonderful recipes! I adore breakfast stratas but haven’t made one for years. We had a graduation party yesterday with a pasta bar, so have leftover sausages, cheeses, baguette, spinach, mushrooms, peppers, etc. I’m going to make this up with all of those yummy bits and pieces! I’ll try to post a pic when it’s done! Thanks for the inspiration! Hi Farrah 🙂 I haven’t, but I’m sure it would work out well! I love make-ahead breakfasts for Christmas morning! 🙂 This one looks amazing! YUM!! What an amazing breakfast dish!! 1. That strata looks awesome! I’d be happy to wait to open presents if that was waiting for me at the breakfast table. 2. We have that same Christmas tradition! We all get a gift, and then we watch each person unwrap theirs before moving on to the next. We could never understand those parents who sectioned off presents at the bottom of the tree and just let their kids dive in! This looks positively magical! Cannot wait to try it! This looks fantastic. I would love this for brunch. Strata is one of my very favorite brunch items to make, and yours look SO hearty and delicious!